But that’s what happens when you’re an undocumented immigrant working across the border in the wrong universe; the job description gets a little complex. This isn’t Miss Hoffman, Angelique’s faithful retainer; this is cross-time companion Dr. Hoffman, Barnabas’ secret weapon. Julia has traveled across the relative dimension in space, pushing her way into another band of time and taking her double’s place in a savage, untamed house that no one — not even with the combined strength of two Julia Hoffmans — can ever hope to keep. 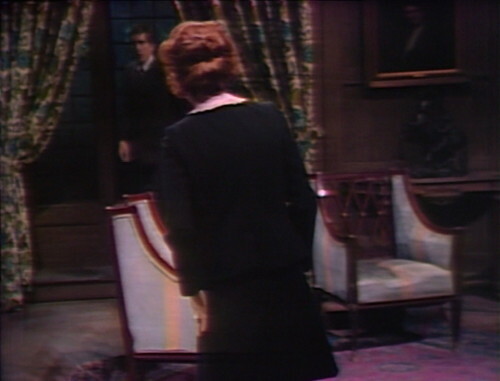 Even the spies have spies on Dark Shadows these days, and the multiple levels of identities and double-crosses are increasingly difficult for me to explain. Angelique has returned from the dead, and she’s pretending to be her twin sister Alexis, ingratiating herself with both her ex-husband Quentin and his new wife Maggie in a plan to split them up, and make them miserable. This shockingly effective plan has succeeded beyond all expectations. Alexis, who’s really Angelique, has enlisted Hoffman, who’s really Julia, to investigate Barnabas, who’s really a vampire from another universe. Angelique tells Julia to follow Barnabas everywhere he goes, and Barnabas tells Julia to follow Angelique everywhere she goes, so Julia’s been running in circles, trying to follow everybody, and she still has to clean the silver and make people cocktails. It’s no wonder we’re not getting anywhere. So this is the point in the storyline where it’s basically all about location, just moving people around from one set to another, discussing where they’ve been, and where they’re going to go next. For example, fugitive Quentin Collins is currently hiding in a cave, except that he’s not, because here he is in Maggie’s bedroom. Maggie’s just woken from a dream about Quentin choking her to death, and when she opens her eyes, Quentin is standing over her in a threatening posture that he claims is innocent, but sure looks like a pre-choking warmup stance to me. He just wanted to come in and look at her, he says. Quentin needs to learn to look with his eyes. And Maggie screams, as all of the barriers break down — between dreams and reality, parallel time and regular time, truth and marriage and sanity and storytelling and whether you live in a cave or not. 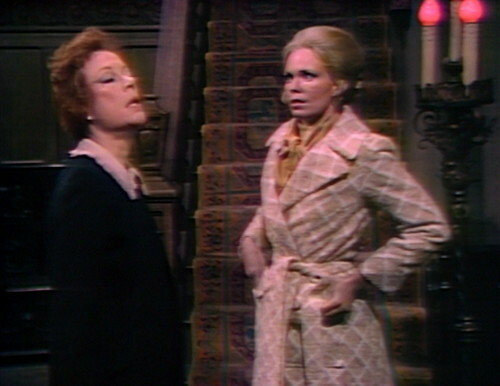 Maggie gets up and dashes out into the hall, screaming her head off and alerting Barnabas, who it turns out he’s been in the house the whole time, which should make things convenient for Julia, because she can follow him everywhere he goes and still get some dusting done. 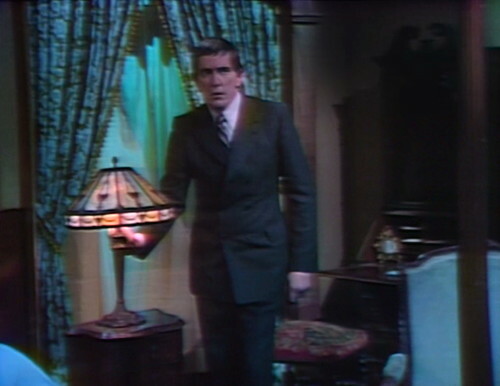 Maggie tells Barnabas that Quentin’s in her bedroom, but when Barnabas goes into the room, there’s no sign of him — just an open fourth-story window, so apparently Quentin’s flown off into the night somewhere. He’s a bird, he’s a plane, or possibly he just walked off the set to get a cup of coffee. He’s got to be around here somewhere. Sprinting to Angelique’s room, Maggie breaks the news that Quentin was here, and he’s probably still here, somehow, fourth-story window or no fourth-story window. And then they have a whole other conversation about where people are, which is all you get in these clockwork episodes. And also, it’s Tuesday, and he knows we go bowling on Tuesdays. He’s probably broken into somebody else’s house; now it’s their problem. 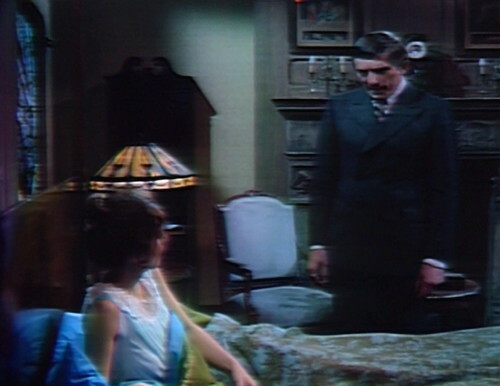 Meanwhile, Barnabas is right downstairs in the drawing room, and he stays there for pretty much the entire episode, openly discussing his plans with Julia, so if Angelique wants to discover his secrets then she should come downstairs and see for herself. “Then you’ve got to follow her, wherever she goes!” he says, and here we go again. We take a break for a quick word about Sun-In Hair Lightener and Betty Crocker Potato Buds, and then it’s right back into the action. “You’re not going out, are you?” Julia asks, because location is the only acceptable topic of conversation these days. “Well, I did, but he went to Loomis House, and I think he’s there for the night.” Also, he’s in the drawing room. Angelique smiles. “Hoffman,” she teases. “Always so inquisitive. 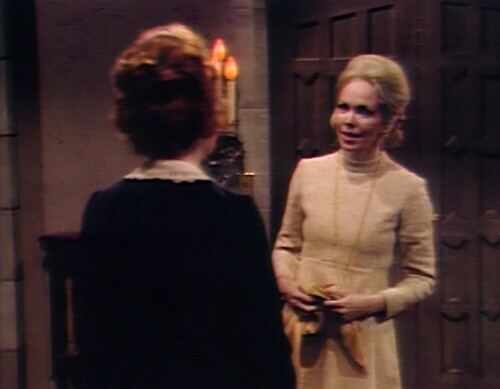 Aren’t you forgetting that it’s Barnabas’ secrets and not mine that you’re supposed to uncover?” Angelique walks out, and as soon as the door closes, Julia grabs her coat and takes off in hot pursuit, probably a step and a half behind her. 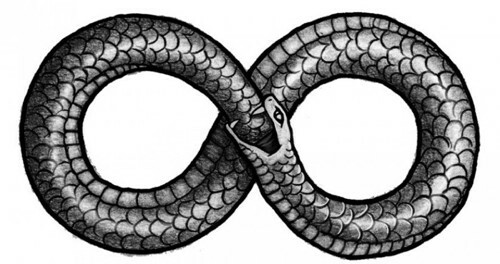 This storyline is an ouroboros, a snake eating its own tail. Everyone is lying to everyone about where everyone is, and what their motives are, and who they’re following and who they’re not following. It is the infinite cycle of creation and destruction. Any progress that they make loops back upon itself, endlessly discussing and eavesdropping and speculating and pursuing. This is a closed system, slowly running out of useable energy. The camera grows darker as the universe expands, a cosmological redshift as the sources of light move farther and farther away. This is the beginning and the end of time, the Second Law of Thermodynamics in soap opera form. 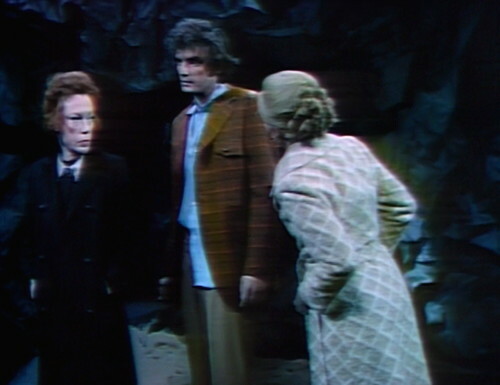 Julia discovers that Angelique is hiding Quentin in a cave, and runs back to Collinwood to tell Barnabas, who it turns out didn’t go home after all. “Apparently, she keeps changing the place,” says Julia, endlessly. 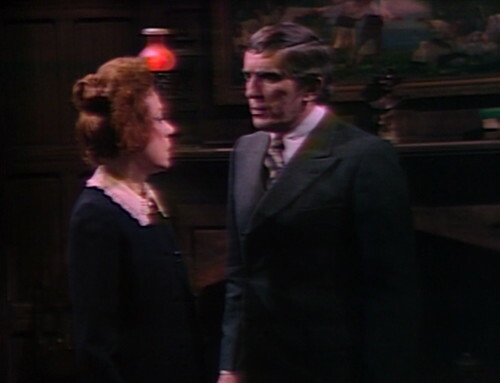 Barnabas wants to go and find Quentin, but Julia says that she’ll go instead, even though she just came from there and didn’t really need this extra loop back to Collinwood. There’s another commercial break, and Angelique returns. “Did anything happen while I was away?” she asks, as the sun fades. “Don’t worry, I will,” Julia replies, learning to love the taste of her own tail. 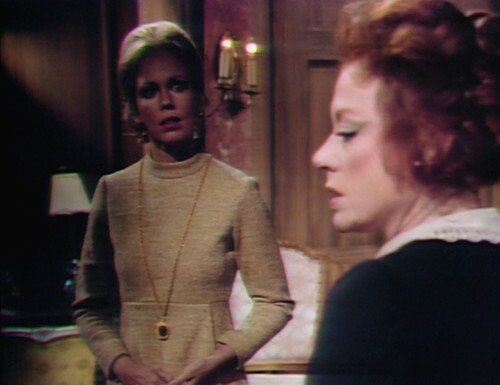 Angelique goes upstairs, and Julia enters the drawing room, where Barnabas has been hiding behind the drapes. “We have no time to waste!” he says, and then he just stands there, looking at Julia. 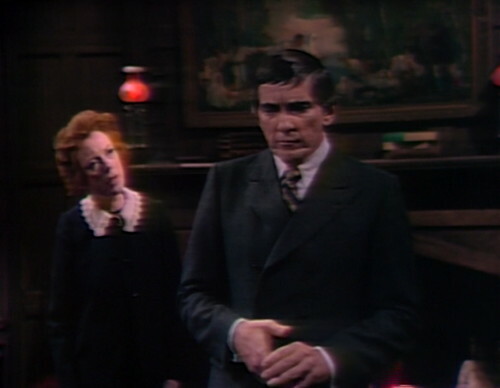 Julia heads for the cave, and Barnabas — who’s supposed to be at Loomis House — stops to check in with Maggie before he leaves. “Quentin will not disturb you tonight,” he says, without evidence. “Can you tell me why you feel that way?” she asks, and he says, “Not at the moment. But soon, very soon, I assure you.” This doesn’t mean anything, because of the Doppler effect. But you’re not leaving, the audience cries. You’ve been in the house all episode, walking upstairs and downstairs and hiding behind the drapes. Julia finds Quentin in the cave, but then Angelique arrives; she’s been following Julia, who’s following Barnabas, who’s following Angelique, round and round. “The beach is swarming with police!” Angelique announces, and issues instructions. “There’s a tunnel at the back of the cave,” she tells Quentin. “Go and wait for me there.” There’s probably some drapes back there that he can hide behind. “Why are the police searching the beach?” Julia asks. The camera faults that have been developing for the last several weeks have really become severe. The color balance is way off, and one camera appears to be shooting through grape juice. When Angelique’s in the hall leading to the Parallel Time room, she’s in the regular present-day hall, with the cockeyed painting and stacked-up chairs. When Julia visits Quentin in the cave, he says, “Hoffman, you know, I never trusted you.” He trusts her completely; he always laughed when Maggie doubted Hoffman. Too bad she doesn’t have an identical double to help with the work. Everyone is lying to everyone about where everyone is, and what their motives are, and who they’re following and who they’re not following. In the right hands this would be sensational — it sounds like a noir thriller — but it seems like they’ve gotten here by accident, rather than any careful study of “The Maltese Falcon” or some such. 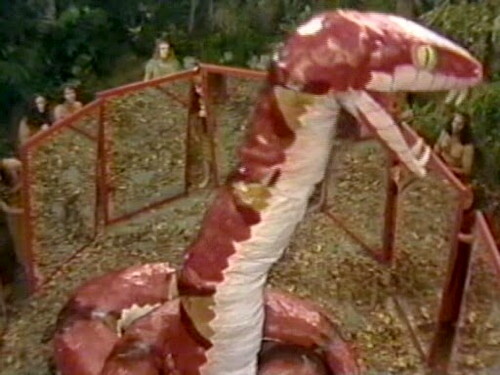 Danny — you gave me a Leviathan flashback with the snake. I wonder what the Leviathans do in PT? Perhaps they secretly assist humans with little day-to-day chores, quietly removing hazardous objects, keeping cemeteries neat and clean, etc. They try to resurrect a race of God-like pigweasels. Their great leader has come to Earth in the form of a little girl who ages very slowly. The little girl’s name is Jazmin Falcon. Her human caretakers run an IKEA store. Did people really just walk into a married woman’s bedroom at all hours back then? Do women really just stay in bed after they think their significant man was about to kill them? Could filming a show through “grape juice” have some deep symbolic meaning? Why am i so hooked on this? Why is Parallel Maggie almost always in bed and sound asleep? Especially since everyone else is up and dressed and it’s seemingly the shank of the evening? I know I’ve already asked, but why in blazes does everyone in RT go to the cockadoodie East Wing to have plot point discussions, just as someone from PT walks up? It’s like those radios in old movies that give just the information needed as soon as they’re switched on! Parallel Maggie has a natural urge to stay parallel to the floor. Folks here may not enjoy PT that much on the television screen, but I think it’s safe to say no group of fans has enjoyed talking about and speculating about PT as we have. Indeed. I think I’ll always enjoy watching the PT episodes now, because they’ll remind me of these beautifully written blog posts and the creative discussions that followed. You’d think that with fewer characters around that the story would be getting tighter and accelerated. Instead they’ve wound up making PT Maggie & Quentin even more tiresome It would seen that the after the DS creative staff brainstorming session they needed extra time to set up the next series of plotlines. One has to wonder what they were planning to do before the brainstorming. How would PT been resolved? We find out that PT Barnabas never really died, and he’s over in RT every time our Barney crosses over.